Use your Five Back Visa gift card anywhere Visa debit is accepted in the U.S. and when you shop at select stores, get up to 5% of your purchase price added back to your card. Shop at every retailer in the U.S. where Visa debit cards are accepted. A growing list of leading merchants will add up to 5% back to your card with every purchase when you use your Five Back Visa gift card. Please enter your card information below to register your card for online, mail or telephone purchases. Please note that enrollment in the Five Back program is automatic and you do not need to register your card to participate. When you shop at participating merchants, the Award Sponsor will add a certain percentage (up to 5%) of your purchase amount (including sales tax) to your Card balance. Visit www.fivebackgift.com for a list of participating merchants and the money back percentage award offered by each merchant. The Award Sponsor will calculate earnings on a purchase by purchase basis and will round earnings amounts to the nearest whole cent (with amounts below half a cent being rounded down and amounts of half a cent or more being rounded up). Earnings generally will be added to your Card balance within 48 hours of the purchase. * The 5% Back Bonus offer is provided by the Award Sponsor and is not provided or endorsed by MetaBank®. These Frequently Asked Questions (“FAQs”) explain the terms and conditions under which a Five Back Visa Gift Card (“Card”) has been issued to you, as well as the 5% Back Bonus offer associated with the Card. 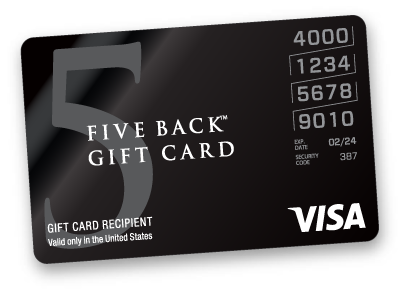 The Five Back Visa Gift Card is a Prepaid Card issued by MetaBank®, Member FDIC, pursuant to a license from Visa U.S.A. Inc., with certain services provided by Blackhawk Network California, Inc. (the “Award Sponsor”). The Award Sponsor is responsible for all questions related to the FAQs, including the terms to the 5% Back Bonus offer. The 5% Back Bonus offer is provided by the Award Sponsor and is not provided or endorsed by MetaBank. This offer is not required for acceptance and use of the Card and the Cardholder Agreement. The Card is a Visa Gift Card that can be used to purchase merchandise and services anywhere Visa debit Cards are accepted in the United States. It is not redeemable for cash, except as required by law. It cannot be used at ATMs, for gambling, or at merchants requiring a manual card imprint. Additional restrictions may apply. We also suggest that you write down the Card number and Customer Service number from the back of the Card on a separate piece of paper in case the Card is lost or stolen. The amount of every purchase you make will automatically be deducted from the value on the Card. There are three ways you can keep track of your balance: visit www.fivebackgift.com; call 1 (844) 201-8796 to make automated balance inquiries 24/7; or track your balance as you spend. Some retailers do not have access to the remaining balance on your Card. Yes, online, mail and telephone order merchants often require that personal information, including name, address, telephone number and email address of the cardholder be verified with the Card-issuing bank prior to purchase. If you wish to make online, mail or telephone order purchases, you should go to www.fivebackgift.com to register your Card. Unless you register your Card in advance, there may be no way an online, mail or telephone order merchant can confirm your identity. Without such confirmation, the merchant might decline your purchase even if there are sufficient funds on the Card. Your Card will no longer work when the remaining value is equal to $0 or the “valid thru” date printed on the front of your Card has passed. If funds still remain on your Card after the “valid thru” date, please call 1 (844) 201-8796 to have a replacement Card with an updated “valid thru” date issued and mailed to you at no cost. The balance on the replacement Card will be equal to the balance on your discontinued Card. You cannot add value to the Card. The Award Sponsor (Blackhawk Network California, Inc.) will add value to your Card when you shop at participating merchants, as described under “How can I earn money back by using my Card?”. If your purchase is larger than your balance, advise the cashier to swipe your Card for the exact amount available on the card. Then pay the remaining balance with another form of payment. Some merchants require the balance to be paid in cash. If your Card is lost or stolen, call 1 (844) 201-8796 to cancel your Card as soon as you can. You will need to know your Card number, so be sure to record it in a safe place. You may also be required to provide additional information. If funds remain on your Card, you will be sent a free replacement Card. Yes, your initial Personal Identification Number (PIN) will be the last 4 digits of your Card number. However, you may personalize your PIN through the cardholder website or by calling 1 (844) 201-8796 (for more information, see the “Personal Identification Number” section in the Cardholder Agreement below). Note the PIN can only be used for purchases and cannot be used to obtain cash at ATM’s or cash back with a purchase. When you make a purchase at a participating merchant, your earnings will be added to your Card balance within 48 hours. If your earnings have not been added to your card within 48 hours, please call 1 (844) 201-8796. Do not reach out directly to merchant partners. Yes. You can continue to earn money back until the balance on your Card is less than 10 cents. At that point, you will stop earning money back (because 5% of an amount less than 10 cents is less than half a cent, and the Award Sponsor rounds earnings to the nearest whole cent).